I was brought up Orthodox and continue to represent myself as such. I married a woman who converted to Orthodox Judaism to marry me. Recently, my influential father-in-law invited me to an important high-profile gala dinner on a Friday night. I did go to the dinner with my wife, and we returned home in a limousine after sunset. Before doing this, I asked my rabbi, and he said that because of the circumstances I was permitted to attend and to ride home. Still, a lot of Orthodox people have criticized me for going to the event and for taking the ride. I want to know — did I act properly? Yes, you acted properly. You respected your father-in-law. You respected the importance of your situation. You respectfully asked your rabbi. By having someone drive, you did not violate the direct Sabbath restrictions against performing forbidden labors. To be clear, driving a car on the Sabbath involves burning gasoline, a form of one of the 39 prohibited Sabbath labors. Accepting a ride from someone in a limo is several degrees away from that directly proscribed action. The criticism you received from others in this instance should be of no concern to you, given the care with which you acted. Many of us know cases where real world constraints and obligations lead sincere Jews to compromise their observances more significantly than you did. One case in point. I live two blocks from an Orthodox shul in Teaneck. And I can tell you that every week I see a gentleman, whom I surmise is representing himself as Orthodox, park his car across the street from me and walk over to the synagogue to attend the Sabbath morning services. Overall, you should know that Orthodox interpretations of Sabbath law have become more restrictive recently. For example, the bias against permitting electronics and new technologies has expanded without nuance, while amazing new technologies have proliferated. The logic of these expanded bans often is based on technical justifications, rather than on analyses of the acts themselves. Consider this. Talking to another human being face-to-face is obviously permitted on the Sabbath. Socializing with other people in a shul or at a dinner or at Talmud study group is a desired joyous activity of Shabbat celebration. However, more than 100 years ago, influential rabbis decided that talking on a telephone cannot be tolerated on the Sabbath, even though it was not readily categorized as one of the prohibited Sabbath labors. And my Orthodox colleagues extend that taboo to the use of a smartphone and to the latest forms of communications — Twitter or WhatsApp or texts or email or Skype. That’s resulted in a major disconnect between many young people (and possibly many older people) and the world of Orthodox expectations. Recent studies have disclosed the emergence of a class of “half-Shabbat” observant Jews, who see nothing wrong with being social on Shabbat on smartphones. It seems like the more that modern challenges proliferate within a system of taboos, the more the prohibition police dig in and become militant and vocal. As a byproduct, you and your commitment to our faith were scrutinized for your trip home from an important event by car, even though you consulted properly and acted in good faith. Given these circumstances, do not fret. It’s clear that you acted appropriately. I’m paying a small fortune to send my kids to Orthodox day schools. But on Shabbat, they refuse to come into the shul to sit by me during davening. They say the services are boring and they would rather roam in the halls, or outside of the shul, and talk or play with their friends. I’m losing my patience with a system that claims to guarantee Jewish continuity, but cannot train my kids to join me in prayer or to sit with me and listen and follow along with the synagogue services. Yes, you are right to be critical and assess your ROI — return on investment. If you look at the claims of the yeshiva champions, you’d conclude that the only institutions separating our Jewish community from assimilation and intermarriage and dissolution and disappearance are day schools. And yet you cannot get your children to participate with you in synagogue services. And you rightfully question the efficacy of the education they are getting. And without doubt, day schools do a fantastic job of trying to educate our children. But in some respects, they do fail. Indeed, you seem poised to ask: Do day schools really transmit new and needed values to children? That’s far from an open and shut question. One part of the answer is that they can’t do it without extensive parental commitment and assistance from the get go. You see, parents who already have decided to spend money on a day school are surely transmitting their values to their children every day. They try their best to instill their values, whether a school effectively backs up those efforts or not. For sure, the day schools enroll a pristine self-selected cadre of students, whose highly committed parents are willing to spend large sums of money to bolster their children’s Jewish commitments, knowledge, and skills. When such children grow up to marry Jewish partners and take on roles as fine and upstanding members of their communities, some of us will argue we should allocate the bulk of the credit to the parents, not to the schools. Now let’s take a step back in examining your predicament and look closely not at the schools, but at the synagogue services that do not seem to engage your children. It’s fair to ask, why should they? Regular shul services are not designed to appeal to children. When I was young, I attended a junior congregation at our shul. It was an abbreviated service for kids, and it was followed by good cake and such. Yes, that was at least a start at setting up an alternative to appeal to kids. When my children were young, I made great efforts to involve them in the Sabbath services and to show them the value of the details of the Torah readings and other pertinent aspects of the davening. I offered them rewards for their participation, and they complied with respect, and sometimes, with enthusiasm. You have made several assumptions of cause and effect, overestimating the value and necessity of day school education. And you make presumptions about the outcomes of your investments of time and energy in that system. If you want your kids to sit next to you in shul, and to participate with you in the services in some way, then work directly on that. Do not assume that paying day school tuition, no matter how high it is, will get your kids to sit and pray with you in the synagogue. If they respond with any enthusiasm towards our laws and customs, it will be due most of all to your persistent creative efforts with your children. Good luck, because no matter how much tuition you pay, the chances of your success are not assured. Nor are they governed by a money-back guarantee if your children refuse to enter the synagogue. 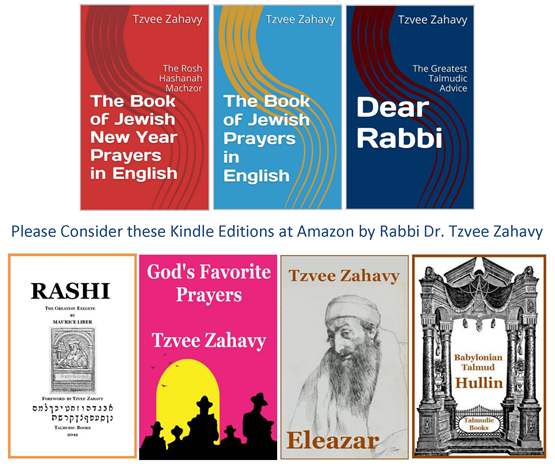 Tzvee Zahavy received his Ph.D. from Brown University and his rabbinic ordination from Yeshiva University. He is the author of many books about Judaism, including “Jewish Magic.” “The Book of Jewish Prayers in English,” “God’s Favorite Prayers” and “Talmudic Advice from Dear Rabbi,” — which includes his past columns from the Jewish Standard and other essays. Is Kirsten Elizabeth Rutnik Gillibrand Jewish? Did Beruryah want to be a rabbi?